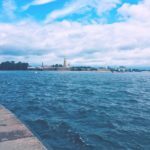 One of the most important projects in the life of the architect and draughtsman Jean françois Tom de Thomon was the creation of the spit of Vasilievsky island with the majestic building of the Exchange and Rostral columns. 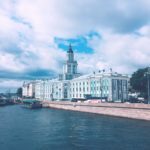 We recall the most interesting facts about the construction and decoration of the spit of Vasilievsky island in St. Petersburg. Stock Exchange Giacomo Quarenghi. The history of the spit of Vasilyevsky island began long before the building of Tom de Thomon appeared here. In the XVIII century this place was already an exchange. In the 1730s it was built of wood, and in the 1780s they decided to rebuild it in stone. The construction of the new Exchange instructed Giacomo Quarenghi. He planned the construction of an oval shape with two porticos, which were supposed to lead granite stairs. However, construction work was very slow. In the ground were scored 10 thousand piles, which managed to build the base and walls, the process is stopped. The Treasury lacked funds, and the merchants, who also participated in the financing, categorically disliked the new Exchange. The main claim was that the building does not fit into the urban landscape. Quarenghi proposed to make changes to the construction, but he did not want to indulge "rough tastes". Coffee as a source of inspiration. In 1805, Jean françois Thomas de Thomon was commissioned to develop a new project of the Exchange building. Before that, the architect did not build anything so monumental, and in fact, he, in addition to the building, had to design the ensemble of the whole Strelka Vasilevsky. According to legend, Tom de Thomon could not finish the architectural project for a long time. And supposedly the idea of the ensemble came to the architect for morning coffee. His wife set the table and put on an oval tray symmetrically two cups, and between them-a coffee pot. So Jean-Francois Thomas de Thomon presented to himself all the geometry of the future area with the building of the Exchange and two Rostral columns on the sides. "Plagiarist" Tom de Thomon. Tom de Thomon was inspired by his own albums with sketches of Roman monuments, which the architect made during his trip to Italy. Also, Tom de Thomon rethought some unrealized projects of fellow architects, for which he was even reproached for copying other people's ideas. When designing the Exchange building, Tom de Thomon took into account the architectural trends of the time — the dominance of classicism, the wishes of merchants-customers who saw the Exchange building as a symbol of the trading power of Russia, and the features of the St. Petersburg climate. The monumental building was built taking into account the possible flood, so it was raised to a powerful stylobate — pedestal. Tom de Thomon's calculations were justified. 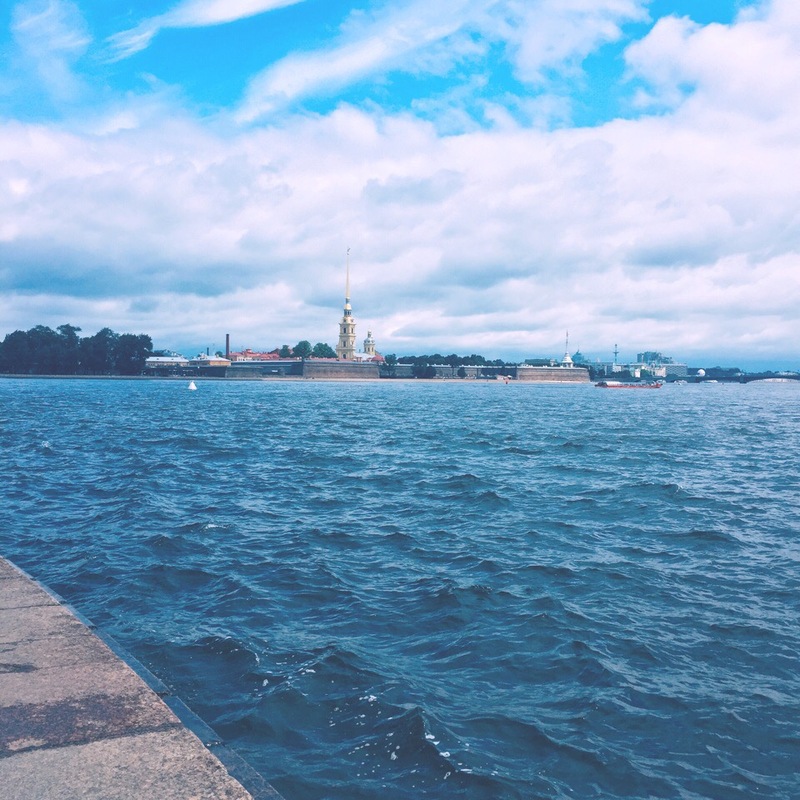 During the severe flood of 1824, when the city's embankments were badly damaged by the Neva flood, the water reached almost the level of the stylobate, but did not break inside the building on the spit of Vasilyevsky island. The brainchild of architect Quarenghi on the bricks. The project of the Tom de Thomon Exchange did not provide for the preservation of the old building. The architect proposed to completely demolish it and building debris to be used for embankment promenade. The venerable architect Quarenghi, the author of the Hermitage theatre and the building of the Academy of Sciences, became furious when he learned about it. To reconcile the architects, count Alexander Stroganov-head of the Academy of arts — offered to hold the auction. He hoped that someone would want to buy an unfinished building Quarenghi. However, there were no wishing, and the old Exchange was dismantled. At the same time, it was possible to save two million bricks, which were used in the construction of the new building. The St. Petersburg Metro. Jean françois Thomas de Thomon wanted to build a building similar to the monument of ancient architecture — the main temple of the Acropolis Parthenon. Its magnificent Thomas de Thomon stock Exchange launched a façade to the river. The rectangular building was surrounded by a colonnade of 44 columns. To the granite stylobate, on which the Exchange towered, there were wide stairs. Most of the interior space was occupied by a huge main hall with an area of 900 square meters. One of the contemporaries of Tom de Thomon wrote:"the Inner hall is one of the most beautiful in the capital in its vastness and proportion." The construction of the arrow. Jean françois Thomas de Thomon led not only the construction of the Exchange, but also the entire architectural ensemble of the spit of Vasilievsky island. Cape fully "converted". Before the Exchange there was a semicircular area, to the coastline of the Cape sprinkled with soil, and it arranged a semicircular ledge. The arrow was decorated with granite descents to the Neva, they were decorated with large stone balls. According to legend, the master stonemason Samson Sukhanov, who participated in the decoration of the entire architectural ensemble, cut them out on the eye. 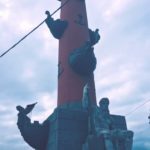 Rostral columns-beacons or monuments of marine glory. Rostral columns on the spit of Vasilievsky island were built simultaneously with the building of the Exchange in 1805-1810. They got their name because they have decorative images of the bow parts of the ship-"rostrum". Such traditionally decorated triumphal columns since the days of Ancient Rome. 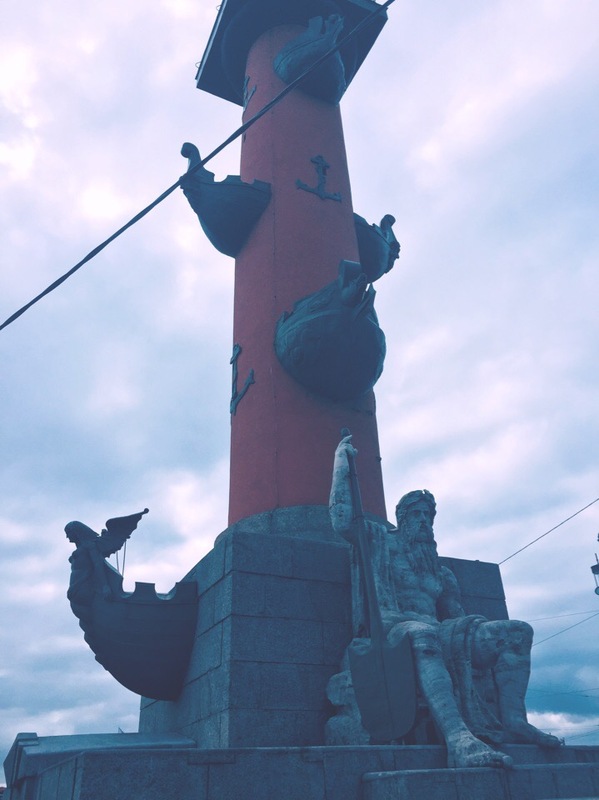 It is believed that initially Rostral columns were conceived as beacons — in a bowl on top had to pour resin and set it on fire, which indicated the path of ships going to the commercial port. 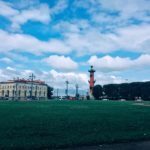 However, perhaps, Rostral columns have always served only as a triumphal monument, in which the torch burned only on holidays. Sculptural design of the ensemble. 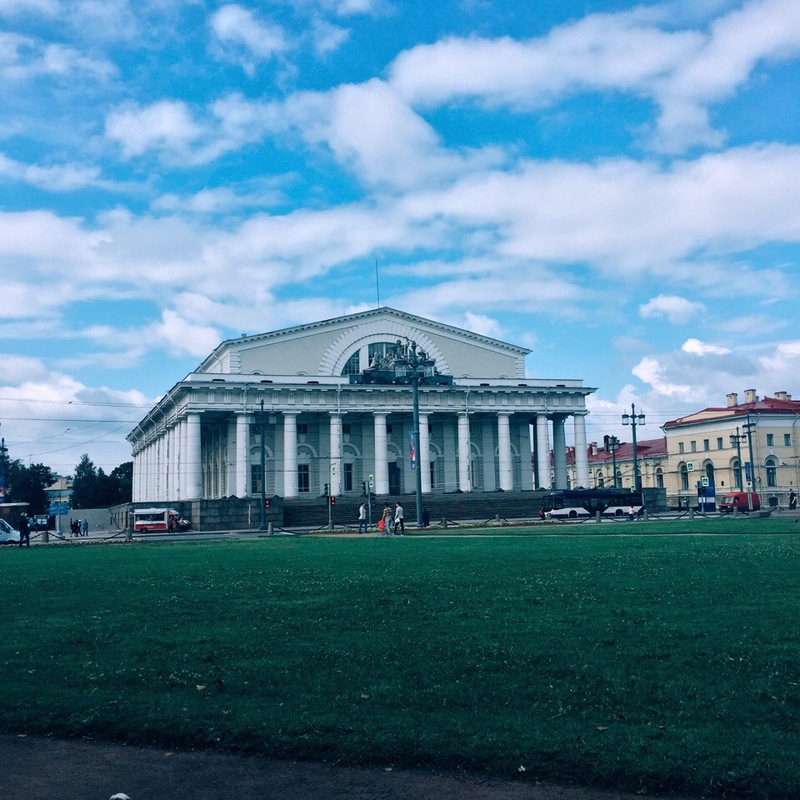 Initially, to create a sculpture for the architectural ensemble invited Fedos Shchedrin and Ivan Prokofiev, but for his work the artists asked too high a price. As a result, the Exchange was decorated by less well-known masters, whose names remained unknown. Above the main entrance of the building there is a sculptural group "Neptune with two rivers", on the opposite facade — "Navigation with mercury and two rivers". 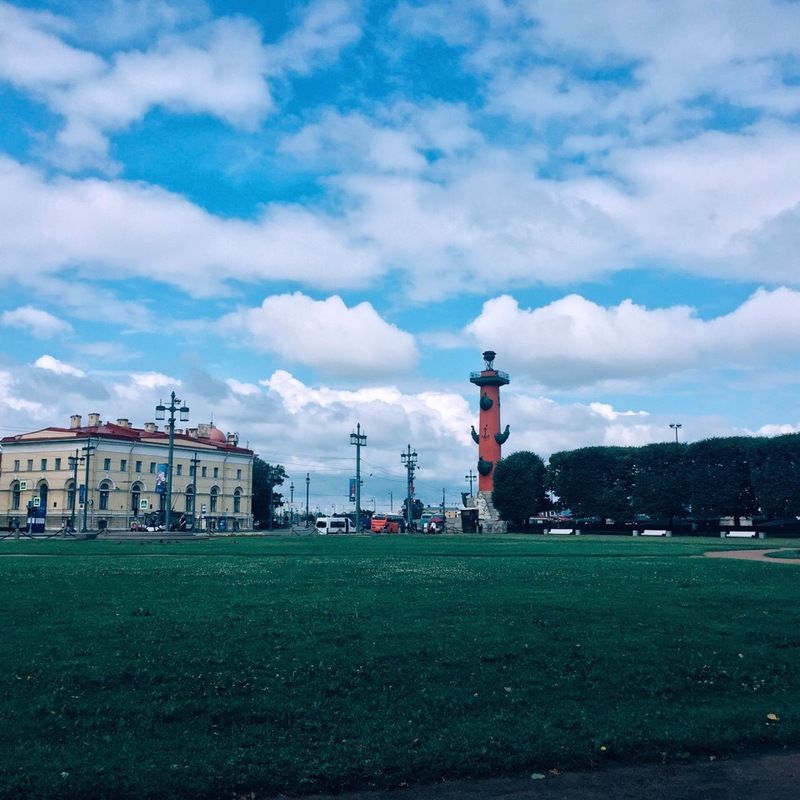 The sculptural decoration of the adjacent Rostral columns was engaged to Joseph, Chamberlain and Jacques Thibaud — they had four allegorical figures of Russian rivers — the Volga, Dnepr, Volkhov and Neva. Tom de Thomon hoped that the sculptures will be cast iron, but they were cut from the Pudost stone. Opening of the Exchange without the main culprit of the celebration. Tom de Thomon did not live to see the opening of his grandiose building. 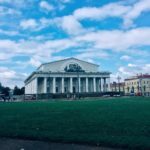 In 1813, he fell from scaffolding, inspecting the Bolshoi theatre building, and after a while died from his injuries. The exchange was opened only in 1816: to complete all the work before the war prevented Napoleon. The opening ceremony was so solemn that it resembled a national holiday. By the architect Luigi Rusca, the building was decorated with colorful garlands, wall hangings and statues. New appointment of of the Exchange. In Soviet times, the building of the Exchange worked as a club of sailors, Energy Institute and other organizations. From 1939 until recently, the Central naval Museum was located here. After his move, the building was transferred to the state Hermitage.